seat Right Rear Heated for Leather Audi Q7 4L 05-09 145TKM!!! From an Audi A6 4F. eletrischen passenger seat (Sports seat Leather with S line embossing). - Electric adjustable. - With seat heating. from your part have send us. Material Leder. 8P 2.0 TDI 6 Speed Manual 3Dr. This part was removed from a Right Hand Drive Vehicle. Compatibility is a guide only. Your item will need to be signed for. In good working order Right Front - 3 Door model - Has a 2 pin plug. B7 2.0 TDI SE TDV MANUAL. Right Front - In good working order - Part Number 8E0 857 706 G. This part was removed from a Right Hand Drive Vehicle. Compatibility is a guide only. Your item will need to be signed for. From aAudi A6 4F. - Heated front seats. Leather seats (incl. - Seat heating on the back. However, the motor is to the raise the backrest for the driver's seat without function. from your part have send us. ). From an Audi A6 4F. Manual sport seating with heated seats. Material Stoff. from your part have send us. Supplied as abge forms. 4L0881362A 4L0 881 362A. Q7 2007 - 2015 . This is a frontright / UK drivers side seat base foam for the following cars This is a new,genuine Audi part. Part number. From an Audi A6 4F. Material Leder. from your part have send us. Produktart Beifahrersitz. PARTS DEPOT - GENUINE PARTS WITH GENUINE SAVINGS! Application is to be used as a guide only. Variations on part number can occur with eitherMODEL YEAR ,MODEL TYPE ,PR NUMBERS/ENGINE CODES etc. Part Number -. Audi A4 8 K B8 sedan / avant side padding left right fabric light grey for vehicles without side airbags. Original Audi A4 8 K B8 sedan / avant side cushion pads left right fabric light grey for models without side airbags. For AUDI A4 / 8E B6. Bearing POS. manually adjustable with seat airbag. (See pictures). Before you buy the part numbers! Our employees are dedicated to solve the problem for you. 4L0883376C 4L0 883 376C. Q7 2007 - 2015 . 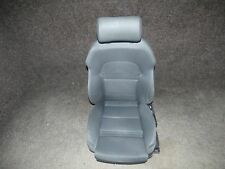 This is a centre row (the row behind the driver)right / UK drivers side seat base foam inert for the following cars This is a new,genuine Audi part. Part number. Without mounting parts as shown Fast shipping the same day if you pay by 2 pm All parts with functional warranty 30 days return policy on all parts without ifs and buts. A3 2009-13 MODEL YEARS (8P)WITH PR NUMBER - N5B 3NZ. IN SILVER/SOUL DYNAMIC FABRIC TRIM - YET. Application is to be used as a guide only. Variations on part number can occur with eitherMODEL YEAR ,MODEL TYPE ,PR NUMBERS/ENGINE CODES etc. (Audi A6 4 G L imousine2.8 FSI petrol 4-door LHD. Color: 4PK Soul Black. · Color code / colour code LZ9Y phantom black / phantom black. Many more original parts from Audi available. Passenger seat). · Engine power /. TO FIT AN AUDI UR QUATTRO TURBO COUPE 08 - 1984 To 07 - 1991. Audi ACOQ Audi Coupe quattro 1985 1986 1987 1988. Audi A80Q Audi 80/90/Avant quattro 1985 1986 1987. NEW AUDI FRONT SEAT TILT CABLE LONG. The New and Used VW Parts Specialist for all VW models worldwide. VW Part Number: 7L0 881 328. Donor Car Colour: Bodywork is Blue Z5Q. Interior trim is Black. It may fit others. (Bicolor Valcona leather). from an Audi A6 4F. The lower wire harness has been dismantled. Electric driver's seat with cracks in the sidewall. - With seat heating. from your part have send us. Produktart Fahrersitz. Content: Audi Q8 4M seat rear right Valcona leather perforated Brown with heated seats. Oberflächenbeschaffenheit Valcona Leder. Audi Q8 4M Quattro V6 3.0 TDI. Running head: 24.952 km. Audi A7 4G A Säule Verkleidung Soul Rechts Links 4G8867234 4G8867233 Orig. Produkttyp Sportsitze. From aAudi A6 4F. - Heated front seats. 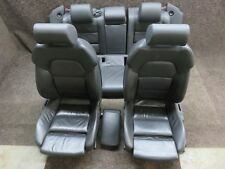 Leather seats (incl. -Belts in leather color. from your part have send us. Oberflächenbeschaffenheit Leder. Einbauposition Vorne. ). From an Audi A6 4F. electric front passenger seat. from your part have send us. Oberflächenbeschaffenheit Leder. Material Leder. Supplied as abge forms. Part Number: 4H0959778B 6hp 4 H 0957372 3Q7. Audi A6 4 G C7 switch multiple soul black decorative ring on the right (passenger's seat). Audi A6 4 G L imousine2.8 FSI petrol 4-door LHD. Color: 6hp Soul Black 3Q7 aluminum. AUDI A4 8 K B8. Original Audi A4 8 K B8. Audi A4 8 K B8 avant 2.0 TDI diesel 4 door LHD. Many more original parts from Audi available. or vehicle data! be present on the paint. to review, we will certainly find a solution. Original Audi A6 A7 4 G C7 hood trim seat depth extension soul black black right 4 G 8881792. Audi A6 4 G L imousine2.8 FSI petrol 4-door LHD. · Color code / colour code LZ9Y phantom black / phantom black. This is a Front Seat Padding for the following cars A1 2011 - 2018. This is a new,genuine Audi part. This is a new, genuine part. Part number. Alternative part numbers. Original Audi A6 4 G C7. Audi A6 4 G L imousine2.8 FSI petrol 4-door LHD. Ventilation motor for comfort seat, seat, Karpin - or Beifahersitz. Many more original parts from Audi available. · Engine codes /. 8L3882632A7PE 8L3 882 632A 7PE. A3 (8L) 2001 - 2003 . This is aright / UK drivers side front seat tilt handle in 'soul (black)' for the following cars This is a new, genuine part. Audi TT 8J Coupé 2.0 TFSI. Many more original parts from Audi available. be present on the paint. described, accurate. • Part number: 8J0881901G. Used portion the specified part number. or vehicle data! AUDI A4 8 K B8. Original Audi A4 8 K B8. Audi A4 8 K B8 avant 2.0 TDI diesel 4 door LHD. handle: seat longit. Eagle right (passenger seat). Colour / color: J50 light grey. Many more original parts from Audi available. WHAT YOU SEE IS WHAT YOU WILL GET. PART NUMBER . Donor Car: 2006 Audi Q7 3000cc Quattro. The New and Used Audi Parts Specialist for all Audi models worldwide. It may fit others. Audi Part Number: unknown. Donor Car Colour: Bodywork is Blue Z5Q. Interior trim is Black. Audi A5 B9 (F5) from 2016. Surface texture: leather gray. Installation position: Right Front. Special features: seat heating. Read part number: 8W96881106G. Condition: good, slightly soiled. Original part! 8X0 885 806 AOG / 8X0885806AOG. A1 (8X) model years 2011 >> 2014 . New genuine Audi part! The fabric also covers the centre rear seat. I can do this with your cars17 character VIN chassis number/UK Reg plate number. Audi A4 8 K B8 insert for seat occupancy recognition right (Beifahreresitz). Original Audi A4 8 K B8. Audi A4 8 K B8 avant 2.0 TDI diesel 4 door LHD. inlay for seat occupied sensor right (passenger seat LHD). RIGHT FRONT PASSENGER SEAT BLACK LEATHER 1K4881516BK AUDI A6 SW < span class = notranslate ' > 2.7 132KW D 5 p AUT (2007) PARTS USED. MPN 1K4881516BK. Category veiocolo: SW STATION WAGON. Being the parts used may have slight signs of wear and tear. Original Audi A6 4 G C7. Audi A6 4 G L imousine2.8 FSI petrol 4-door LHD. Air Pump Comfort seat, Karpin - or Beifahersitz. Many more original parts from Audi available. · Engine power /. be present on the paint. Part Number: 8E0813545A 8E0813546A. From aAudi A6 4F. Produkttyp Isofix. Produktart Isofix.